The Bosch Group is hugely bullish on India. It foresees strong signs of recovery in the Indian market and forecasts a positive development over the mid-term. “The Indian economy is on the rise again and holds tremendous potential,” said Dr Volkmar Denner, the chairman of the board of management of the Bosch Group during his visit to India in Bangalore. In 2017, the leading global technology and services company posted strong double-digit growth as sales went up of 15.4 percent to 2.2 billion euros (Rs 17,333 crore). With a projected 7.7 percent GDP-growth for the Indian economy in 2018 and a similar level for the coming years, Bosch expects to continue with its momentum. The main contributors are the development of the local automotive industry, which holds opportunities for diesel technology, electromobility and connected mobility as well as the government initiatives for connected manufacturing and connected cities. 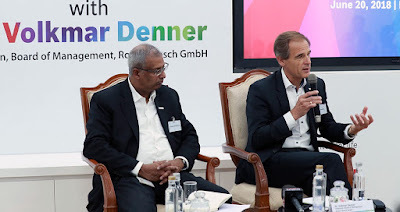 “To meet the rising demand in the Indian market with tailored solutions and expand India’s strong role in our global network, we will invest Rs 1,700 crore (220 million euros) over the next three years,” announced Denner. A major share of this will be used to expand Bosch’s smart campus in Adugodi and modernise manufacturing facilities in the country. India plans to achieve BS-VI emission norm implementation from April 2020 and adopt electromobility solutions built for Indian conditions. 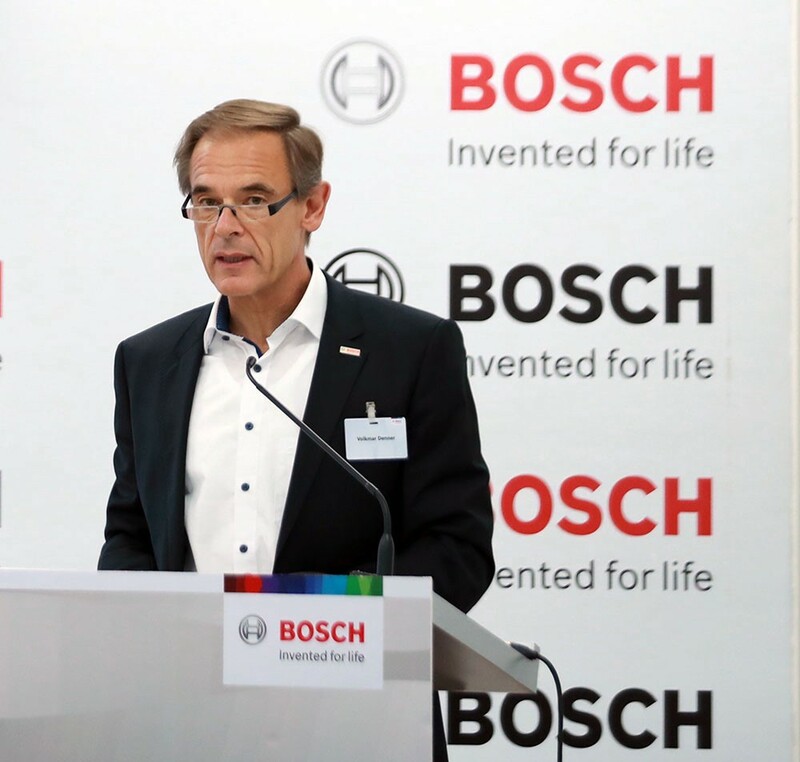 Bosch says it has the right technology to support both initiatives. The company believes that the ICE (Internal Combustion Engine) will continue to be the mainstream solution for freight and commercial vehicles. However, a key role here will be played by Bosch India’s electrification initiatives, to address the transformation in urban mobility. Keeping in mind the country’s climate change targets, Bosch views the co-existence of fossil fuel engines and electrification with hybridisation as an interim solution. The Bosch Group is hugely bullish on India. It foresees strong signs of recovery in the Indian market and forecasts a positive development over the mid-term. “The Indian economy is on the rise again and holds tremendous potential,” said Dr Volkmar Denner, the chairman of the board of management of the Bosch Group during his visit to India in Bangalore today. Another field of growth in India’s thriving automotive industry is the rising demand for connected mobility. Bosch says it is continuing to drive forward its transformation into a provider of mobility services. The company recently established a Connected Mobility Solutions division to develop and sell digital mobility services. “Connectivity will fundamentally change how we get from A to B, and in the process it will help to solve today’s traffic problems. We are using it to realise our vision of emissions-free, stress-free, and accident-free mobility,” said Denner. Around 18,000 out of Bosch’s 31,000 associates in India work in research and development (R&D). This underlines India’s importance for the Bosch Group’s global network as more and more innovations are coming out of the country into the world. India also plays a significant role when it comes to Artificial Intelligence (AI). “Most of the products in the near future will be linked to artificial intelligence. These products will either possess that intelligence themselves, or AI will play a key role in their development or manufacture,” said Denner. In 2017, the company invested 300 million euros into its Bosch Center for Artificial intelligence (BCAI) across three continents – one of the main locations being in Bangalore, India - next to centres in Sunnyvale, U.S. and Renningen, Germany. Additionally, Bosch in India has also partnered with IIT-Madras and set up a Robert Bosch Centre for Data Science and Artificial Intelligence at IIT-Madras with a fund of Rs 4 crore per year for five years. It will set a precedent in the way big-data is used to improve our problem-solving capability in the industry. At the same time, the collaboration will result in shared outcomes for the benefit of society.